Abstract Universities are currently offering many virtual educational programmes that require teachers and faculty to be competent in the use of Information and Communication Technologies (ICT) to be able to achieve significant educational processes. 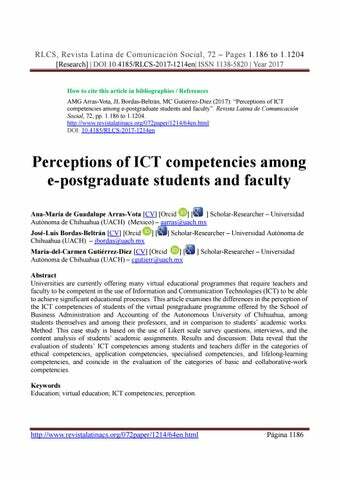 This article examines the differences in the perception of the ICT competencies of students of the virtual postgraduate programme offered by the School of Business Administration and Accounting of the Autonomous University of Chihuahua, among students themselves and among their professors, and in comparison to students’ academic works. Method: This case study is based on the use of Likert scale survey questions, interviews, and the content analysis of students’ academic assignments. Results and discussion: Data reveal that the evaluation of students’ ICT competencies among students and teachers differ in the categories of ethical competencies, application competencies, specialised competencies, and lifelong-learning competencies, and coincide in the evaluation of the categories of basic and collaborative-work competencies. Keywords Education; virtual education; ICT competencies; perception. RLCS, Revista Latina de Comunicación Social, 72 – Pages 1.186 to 1.1204 [Research] | DOI:10.4185/RLCS-2017-1214en| ISSN 1138-5820 | Year 2017 Contents 1. Introduction. 1.1. Justification. 1.2. Research objectives. 1.3. Research question. 1.4. Research hypotheses. 2. Methods. 2.1. Research techniques. 2.2. Universe of study. 2.3. Instrument reliability. 3. Results and discussion. 4. Conclusions. 5. References. Translation by CA Martínez-Arcos (PhD in Communication -Universidad Autónoma de Tamaulipas) 1. Introduction The changes experienced by humanity in recent times have defined new forms of life. It is argued that we are living the third great revolution, this time in the area of computing, which follows the agricultural and industrial revolutions. This is because the incorporation of information and communication technologies (ICT) have irreversibly transformed society and human existence (Velarde, Bernete & Franco, 2015) and permeated all human activities (Bozna, 2017), including education, “... which derives from the Latin words educare, which means “to bring up”, “to nourish”, “to guide”, and educere, which can be defined as a “educate” “instruct” through various languages; and it is present in the actions, feelings and attitudes of people” (De Jesús, Andrade & Martínez, 2012, p. 4). Therefore, it can be said that education “is a social process that is determined by the context and worldviews of its actors, teachers, students and institutions, and that is currently being modified by new socialisation and communication processes” (Guzmán, 2008, p. 22), through the information and communication technologies (ICT), which have become the transforming agent of society, which can in turn use information to create knowledge (Falco, 2017). In the context of education, one of the effects of technologies is an increase in the of forms of teaching, since face-to-face, semi-present and distance education models have incorporated the online or virtual mode. The latter mode takes place in a new “space and offers a varied range of resources based on ICT. This environment creates an area for work and communication that promotes and facilitates education processes” (Matilla, Sayavedra, Alfonso, 2014, p. 12). In fact, virtual education is defined as: “the use of new technologies and learning tools as complement of a series of actions and synchronous and asynchronous communication processes whose objective is a type of learning that seeks to develop attitudes that allow individuals to adapt themselves to new situations generated by globalisation and the access to new knowledge and information that can be applied to specific cases” (Guerrero Muñoz, 2008, p. 3). RLCS, Revista Latina de Comunicación Social, 72 – Pages 1.186 to 1.1204 [Research] | DOI:10.4185/RLCS-2017-1214en| ISSN 1138-5820 | Year 2017 Thus, it can be said that virtual education requires scientific and technological literacy strategies, to facilitate the effective performance of each person in a society in permanent transformation, where learning is conceived as “the connection, mixture and restructuring of information” (Cabero Almenara & Llorente Cejudo, 2015, p. 191). In this sense “learning occurs when people connect information in a learning community” (Mercado-Varela, Beltrán Villegas Perez, Rivera Vazquez, & RamírezMontoya, 2017, p. 144). Competencies are required to achieve learning that enables people to restructure, mix and find new connections. These competencies can be developed and built based on the internal motivations of each person (González Duéñez, Castillo Elizondo & Hinojosa Rivera, 2017), and are defined as the capacities a person uses to cope, apply, act upon or mobilise a set of cognitive resources, perception and evaluation schemes to solve a complex situation” (Guzmán Ibarra, Marín Uribe & Inciarte González, 2014, p. 25). Competencies involve the domain over a wide collection of strategies in a specific field or area of human activity (Chávez López & Morales Rodríguez, 2016). Therefore, ICT competencies are conceived as “the abilities, skills, knowledge and attitudes applied to the use of information and communication systems” (Arras Vota, Torres Gastelú, García-Valcárcel 2011, p. 3), through the management and application of technologies, the ability to solve problems, the critical analysis of contents, as well as the ethical construction and socialisation of knowledge. Based on this definition, ICT competencies can be classified into basic, application, specialised, collaborative-work, lifelong-learning and ethical, which are described below. Basic competencies Basic competencies refer to the knowledge required to manage technologies (García-Valcárcel & Arras-Vota, 2011), which involves the use of productivity applications such as Microsoft Word, Excel and PowerPoint, as well as digital tools to obtain information, the production of academic work and its presentation through diagrams and videos. Application competencies Application competencies refer to the productive use of applications for information management and professional development through digital resources and networking (UNESCO, 2008). A student who is competent in the use of information is able to determine the nature and level of information he or she needs (Jaramillo, Hennig & Rincón, 2011). Thus, the use of scientific databases to build knowledge and the use of productivity applications such as Word to insert references automatically can be considered as indicators of this category. Specialised competencies A person has specialised competencies when he or she is able to solve problems, create original works, plan and organise activities related to a particular project and communicate what he/she learned effectively through digital tools (García-Valcárcel, Arras-Vota, 2011). This construction involves analysis and decision-making in relation to the content of the messages obtained through ICT, which according to Jaramillo, Hennig and Rincón (2011) means the effective use of information to accomplish a specific purpose, such as the construction of evidence-supported knowledge. This survey was conducted via e-mail, WhatsApp and Facebook, and was responded interactively through the electronic device selected by the respondent. The statistical analysis of the data was performed with the Statistical Package for the Social Sciences (SPSS version 20.0), which is an application for predictive analytics (IBM, 2016). 2.2. Universe of study The research was conducted at the School of Business Administration and Accounting of the Autonomous University of Chihuahua (UACH). This institution was founded on 8 December 1954 (Universidad Autónoma de Chihuahua, 2008), while the School of Business Administration and Accounting was funded on 18 December 1958 (Facultad de Contaduría y Administración, 2013). This School offers its services to students in nine municipalities of the State of Chihuahua and offers online academic programmes for people who have access to ICT in every corner of the planet. The actors that formed the universe of study were 198 students and 46 teachers from the online postgraduate programme in 2016. The sample of students was 64.67, which was rounded to 65. Meanwhile, the sample of teachers was 31.10 of the universe and it was rounded to 31 (Table 1), resulting in 46 teachers. Meanwhile the sample of teachers who participated in the structured interview was 23. 3. Results and discussion Basic competencies The basic competencies section is composed of three items related to the management of technologies, productivity applications and students’ presentations that use these resources. 1. Students are proficient in the use of scientific databases in search for answers to the questions arising in the course I teach. 2. Students perform information searches in the scientific databases available in the UACH to support their academic papers. RLCS, Revista Latina de Comunicación Social, 72 – Pages 1.186 to 1.1204 [Research] | DOI:10.4185/RLCS-2017-1214en| ISSN 1138-5820 | Year 2017 training in the use of Word to incorporate bibliographic references and bibliography in the format requested by the teacher. In fact, the comparison of all the evaluations made by students and teachers on implementation competencies present a significant difference in the ANOVA, ranging from 0.001 to 0.000, which reflects a gap between the perception of students and their teachers, which can be supported with evidence taken from the academic work presented by students of the virtual postgraduate programme under study. Here are two fragments of students’ works with information obtained from non-scientific databases, such as the case of promonegocios.net (Thompson, 2007), from where a student took the following quote but did not mention its precise origin nor used Word automatically for this task, and neither included personal contributions about the cited work: “The issues that have to do with ethics are often ambiguous. There are and there will be situations in which some might consider that the activities are inappropriate or lack ethics, while others will consider it acceptable. It could even be the case that the same activity may be considered ethical at a given time and unethical at another. Therefore, it is recommended for firms to implement codes of ethics...” (Student 1 of 2016). Another student also included information from a web page (Tiendas Mascotas, no date) but included no reference about its origin and author, as if it were his own knowledge. Here is the text that was part of an assignment: “The trout is a popular name used to refer to several species that are related to the salmon family. They are cold water fish that usually inhabit rivers and lakes distributed throughout North America, Asia and Europe...” (Student 2, 2016). This finding shows that not all the virtual postgraduate students are proficient in information management through ICT and that it is necessary to work more on aspects of implementation to perform searches in documents included in scientific databases that facilitate the generation of original knowledge. These results indicate that students perceive themselves to be more competent in comparison with the qualifications that teachers give and that this discrepancy can be exemplified with fragments of the papers presented by students. This comparative result shows how the humans make a selection that, in a way and to some extent, “builds” the object that they see or observe (Martínez, 2006), in this case in a way which favours them. However, it is important to note that one of the aspects to improve, by students, is the reading of more scientific articles and texts that will enable them to expand their knowledge in a certain area, in order to support knowledge with reliable sources and optimise the use of Word. 1. Students read at least five scientific articles, using ICTs, to perform an assignment. 2. Students break down the elements of the article and make relevant comments that enrich their academic work 3. Students create original works using ICT as a means of personal expression. 4. Students have the ability to solve problems through the use of ICT. 5. Students have the capacity to build their own concepts based on the definitions of other authors. 6. Students have the skills and knowledge that allow them to carry out a research project using ICT. 7. Students have the competencies to generate key questions and problems, formulating them clearly and precisely. The differences between teachers and students about specialised competencies are significant, with an ANOVA of 0.000 in all items. This indicates a gap between students’ self-perception and the way teachers evaluate students’ competencies. It should be noted that the standard indicates that the competent learner must know that existing information can be combined with their own ideas to produce new information and achieve the connective learning, from which information can be found, mixed and restructured (Cabero, 2015). However, there are authors who highlight the lack of knowledge on young people in the use of digital media and technologies to solve conceptual problems and contribute to the creation of knowledge by participating with others in creative and innovative actions (Álvarez-Flores, Núñez-Gómez & Rodríguez Crespo (2017). The findings of these authors are consistent with the results presented by Jaramillo, Hennig and Rincón (2011), who found that students showed no specialised competencies and, in this case, students themselves gave a low rank to their reading of scientific articles for an assignment and the analysis of the elements of the article. Collaborative-work competencies These competencies were evaluated through an item that establishes whether this type of work is carried out by virtual postgraduate students. Students produce scholarly works as a part of a team by means of variety of digital resources. 1. Students use ICT to learn on a permanent basis. 2. Students are open to different ways of thinking that will enrich their learning. In terms of the lifelong learning competencies, there is a significant difference of 0.000 in both items, between their perception among students and teachers. The former value these competencies more favourably than the latter and it is important to note that this type of competencies needs to be strengthened to start learning and persist in it, organise it, manage time and information, either individually or in groups (European Commission, 2007), given that throughout our lives learning is configured as a valuable tool in education (García Revilla, 2017), which requires ethical, application and specialised competencies, in order to have clarity on the sources and their responsible use. 1. Students always cite the authors whose work they use in their papers. 2. Students use ICT to learn from others and recognise their work through citation and references. Article received on 4 August 2017. Accepted on 11 October. Published on 19 October 2017.